1799 dress, Bath Fashion Museum. 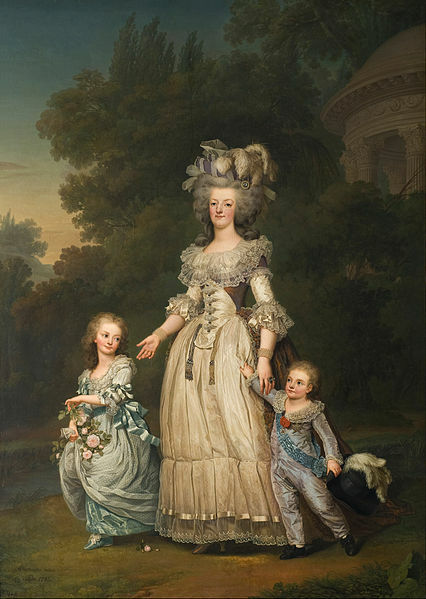 Paris was the center of fashion at the time and as France plunged into its Revolution, French women began to dress more simply. Taking inspiration from neoclassical imagery, ladies' gowns were simple and high-waisted with a lot of emphasis on the bosom. Also, unlike the later Victorian period, the skirts were not so voluminous and the corsets not as restrictive. Ladies in this period wore a shift, kind of like a slip, under their dresses. Then came the corset. Short stays supported the breasts and ended under the bust. Long corsets ended around the waist (the real one, not the high waist), but its purpose was to give support and provide a smooth line on the dress, not to pinch everything in. Drawers were not worn by Englishwomen until later in the nineteenth century. Ladies wore petticoats under their dresses, sometimes up to five of them, depending on the weather. Ladies wore stockings and garters under their skirts. Shawls and spencers were worn over the dress and gloves and hats were worn, too. A woman of the upper and upper middle classes would wake up and don her morning dress. A morning dress was worn at home and was generally the simplest and plainest of gowns. But then, if a lady decided that it was time to pay calls or receive callers or go shopping or go to church, then for a rich woman, a change of clothes was in order. For a lower middle class woman, a change in shawls or fichus would probably have to suffice. You can check out more on day dresses here. Evening dresses were lower in the bosom (cleavage was not shown during the day), with maybe a short train in the back and lots of accessories. 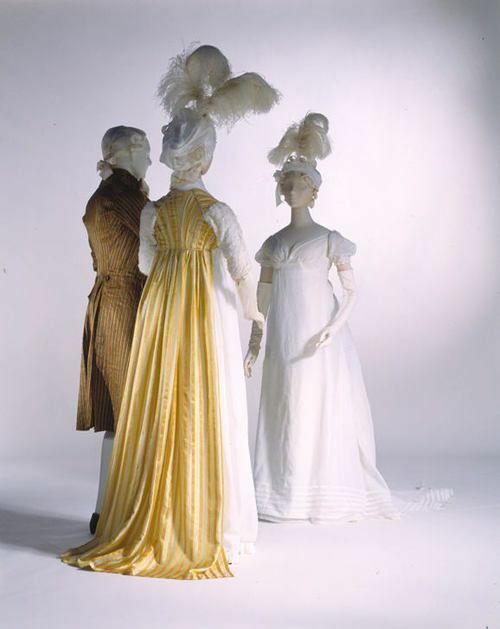 Below are ball gowns from 1800, from Jane Austen's World's Pinterest. What do you think of early 19th century fashion? I like the simplicity of the look--I get scared looking at Victorian era bustles and corsets and huge skirts--but the dresses tend to look thin and I feel cold merely looking at them. Also, high-waisted dresses make people look pregnant. I really like empire waist dresses. While they can make you look bigger than you are, on the flip side, if you happen to be bigger in the waist, it works as a great camouflage. Lol! Plus that style looks great on people with short waists like me. At least I think it looks good. Lol! I love petticoats and such, too. I actually think I would have liked the non-binding kind of corseted fashion. Empire waist dresses also make the bust look bigger, which can be an added bonus. I like the simplicity and elegance of the overall look and the lack of scary Victorian corsets and crinolines. You kow, I thought I was already following you...sorry about that! New follower here :) I agree with Krystal, I love the empire waist dresses. Very informative post. I'll be coming back for sure! !